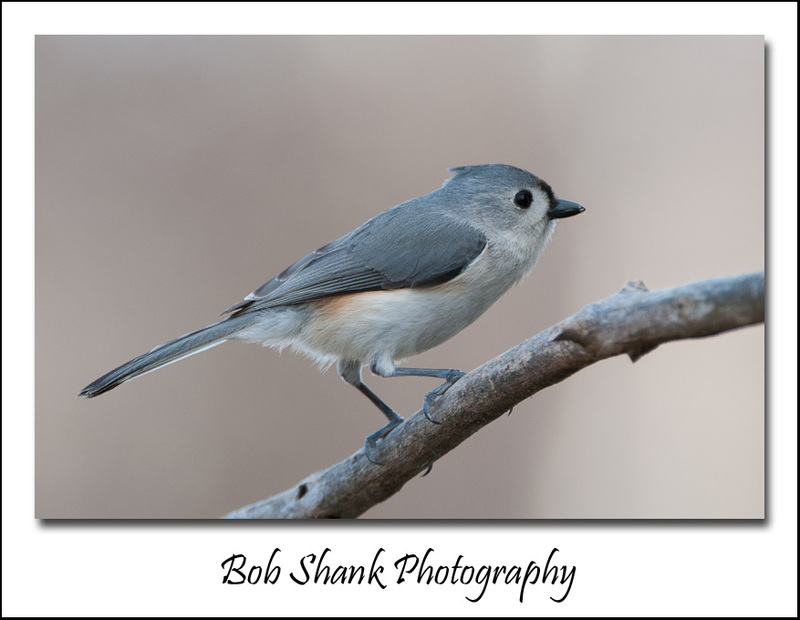 I observed another new bird at our backyard feeder today. 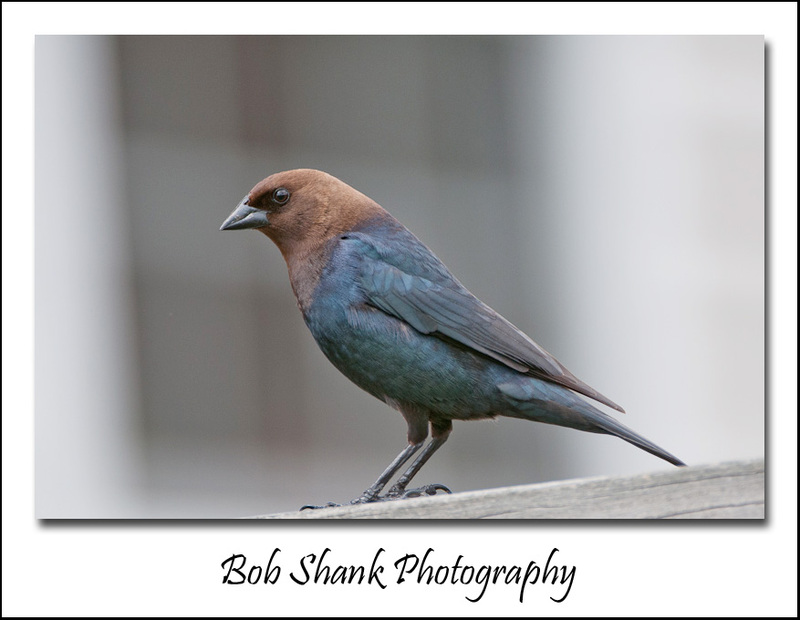 I was photographing out of my blind again and this bird just came in and landed on the deck railing. It has a brown head with an all-black body. After clicking a few shots it flew down to the ground and started eating seed that had fallen from the feeder. Then a similar looking female joined in the action. 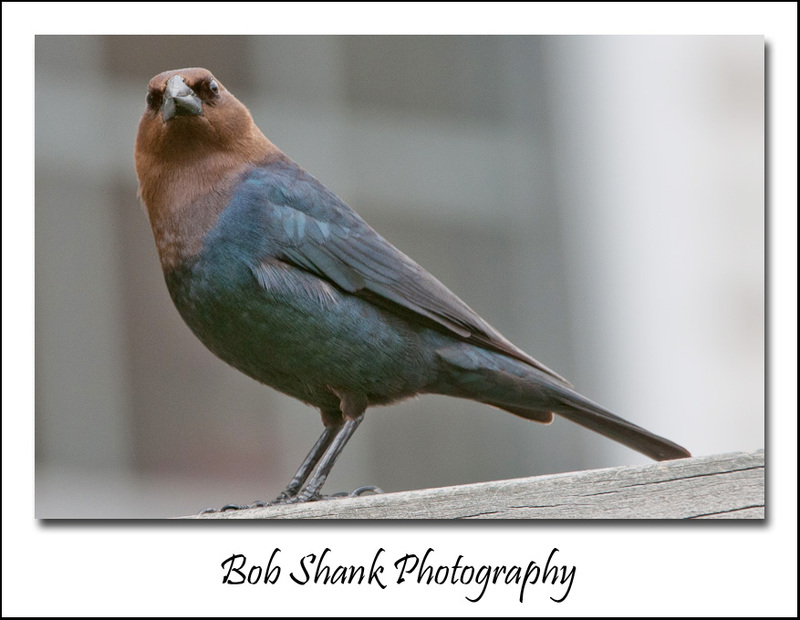 It turns out that this bird is called the Brown-Headed Cowbird. What a name! I love it! This bird typically walks on the ground to find food and often holds its tail over its back while it is foraging. Diet consists of insects, fruits, grains, and seed. It is found in Pennsylvania throughout the year. The female does not sport the brown head but is all an off-gray color. 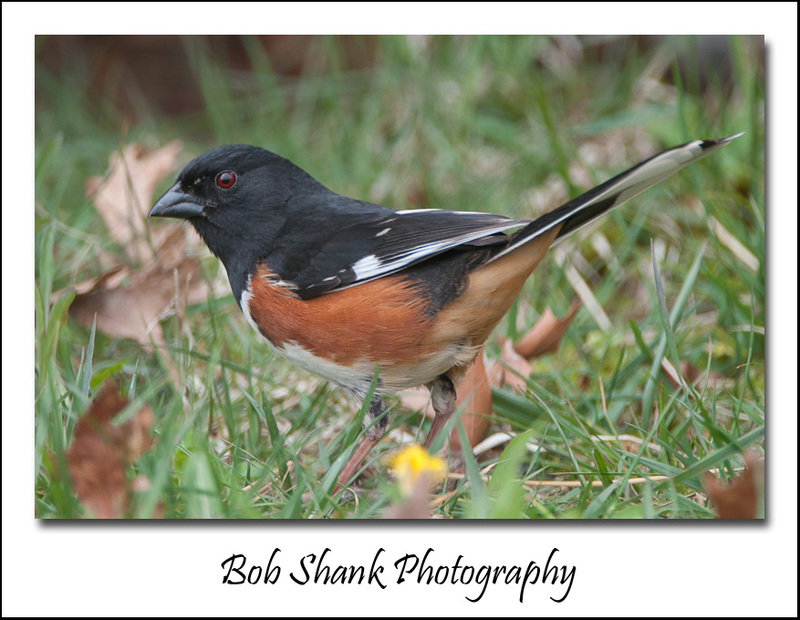 Today I photographed two Eastern Towhees — a male and a female which came to our backyard! I first spotted a male Towhee yesterday for the first time this year. I actually heard many of their unique calls over the past few weeks but didn’t see one until yesterday. Their call sounds like they are saying, “drink you tea.” I could mimmick the call with my own imitation whistle and repeatedly received a call back. Not long after I captured one decent photo of the male Towhee, I saw a female come in to for lunch. It didn’t take long before it snagged a mealworm from a log, which it proudly displayed from it’s tightly clamped beak. The Eastern Towhee is an active bird with a unique and inviting call. It’s red eye is unmistakable. Listen for its call and look for one the next time you are outdoors. 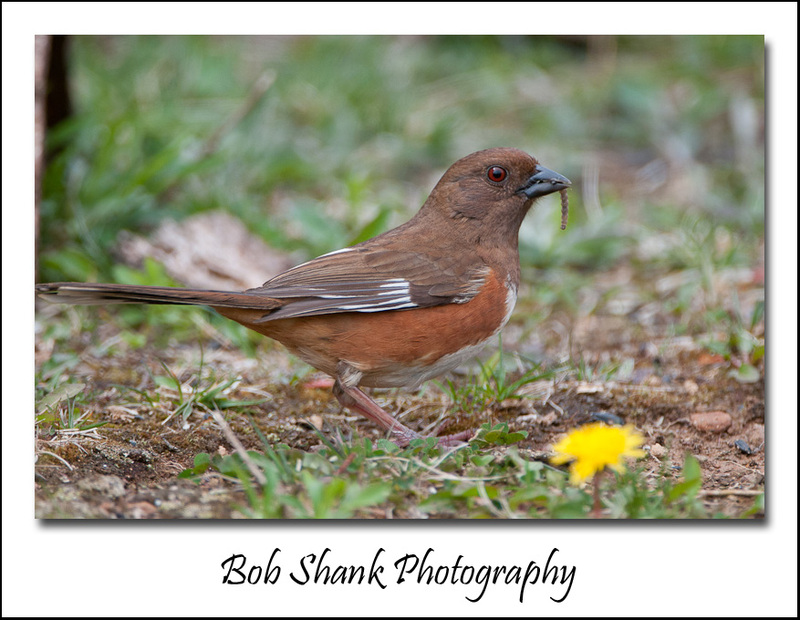 The Towhee is a wonderful bird to watch and photograph! 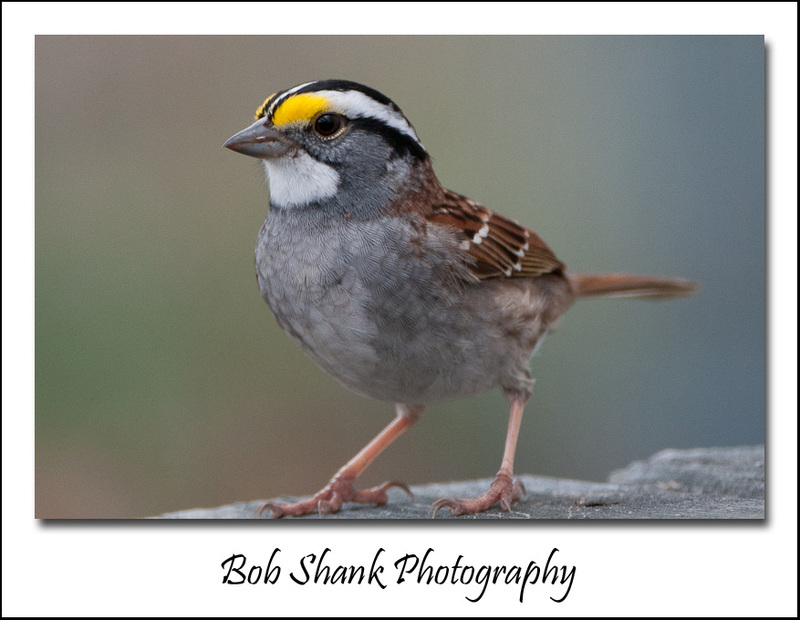 I spent some time in my blind this evening watching and photographing a few birds and a chipmunk. I always enjoy this time spent outdoors and the blind really conceals me and most of my movements. Every once in a while, moving my camera into the right position scares a bird away, but overall it works very well to get some decent photos of these amazing birds. For you birders out there, what species is this? It looks like some variation of a sparrow to me, but I am not a birder. Any help you can offer in properly identifying this bird is much appreciated! I spent a couple hours in my backyard blind again today. The birds were cooperative and I am slowly learning how to capture better bird photos. It’s not easy because birds are quick! 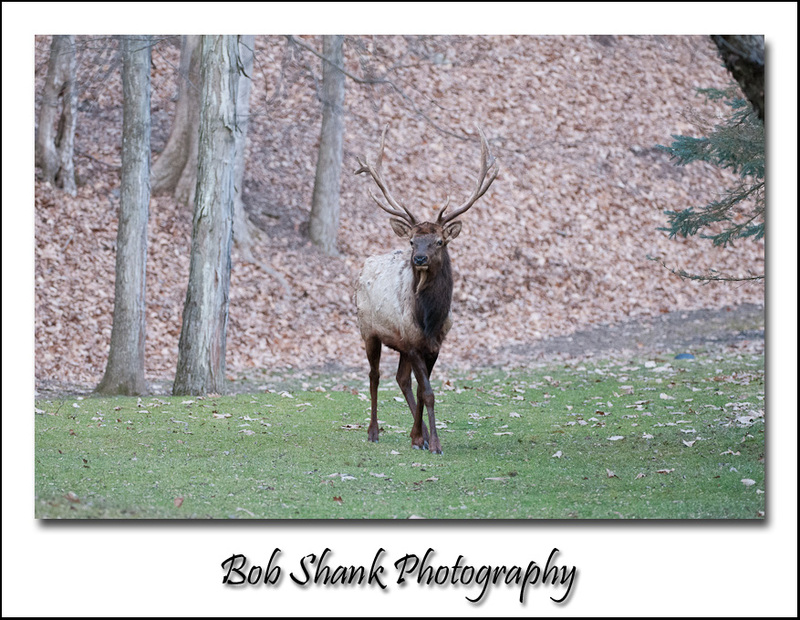 I am more accustomed to photographing elk, which move a lot more slowly! Today I learned an important lesson: don’t set up the camera too close to the birds. The problem wasn’t being too close that I scared the birds, after all, I was in a blind. The problem was that I was inside the minimum focusing distance of my zoom lens! I re-situated my blind this morning to get better angles on my perches, but I actually set up too close to the action. After some frustrating results early in the evening, I moved the blind back about six feet and then photographs became much more clear! 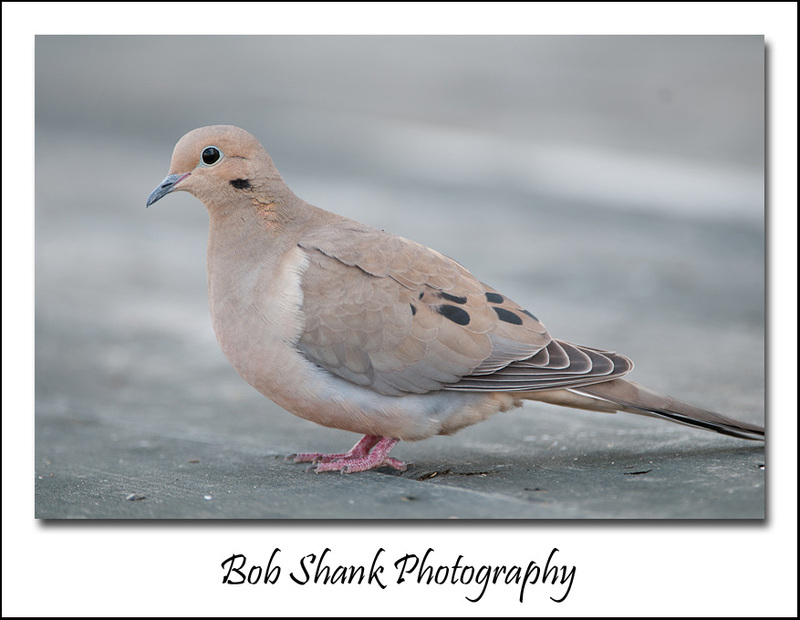 I continue to learn and am intrigued with the challenge of bird photography. I hope to be back out in my blind again tomorrow! Getting closer to the subject is the name of the game in wildlife photography. Yes, sometimes we do want to include the surrounding environment and habitat that wildlife call their home, but getting closer will help a lot in separating an animal from a busy background. Also, there’s nothing worse than taking a photo and then sharing it with someone who asks, “what’s that spot over there?” Your reply, “Oh, that’s the bull elk I wanted you to see.” That little spot just doesn’t do any justice to your photography. So, how do you get closer to your subject? 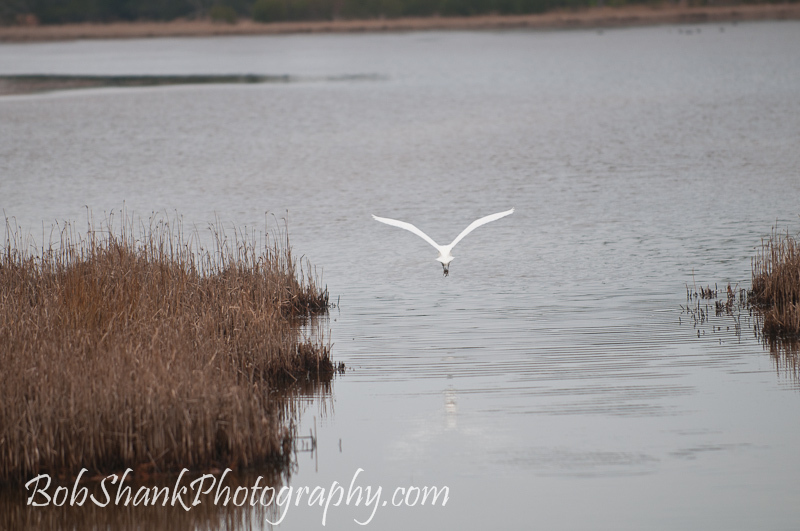 First, buying telephoto lenses is an important priority for any budding wildlife photographer. Long glass helps us get closer while maintaining a safe distance from the animals we are photographing. In fact, some National Parks even have a minimum viewing distance that requires longer lenses if we are going to fill the frame with our subject at this safe distance. 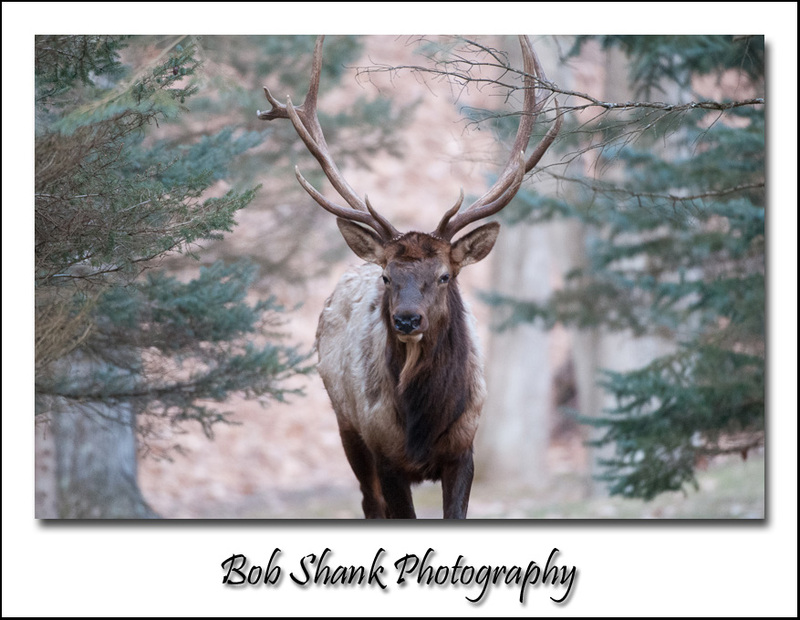 300mm is probably the shortest option for a good wildlife photography lens, but I have used the 70-200mm with a 1.4x teleconverter with larger mammals like the elk here in Pennsylvania. Yes, long glass is important and very helpful, but it is not the end all solution every time, especially with smaller subjects. This brings us to the main topic of this photo tip-how to physically get closer to our subjects. You might assume that stalking or sneaking up on a subject will work. Sometimes yes and sometimes no; but typically no. Animals live longer lives because they are wary of danger, especially human danger. Big racks don’t get big by animals being careless. Rather than sneaking up on them, I try to be as calm and unassuming as possible. I take my first photos from a distance if I haven’t photographed this species before just to get an image of this new subject. Then I see if the animal “accepts” me. What I mean by this is noting whether the animal goes back to its routine behavior of grazing or whatever. If not, I don’t move. I look in the opposite direction, remaining as calm as possible and pretending that I don’t care that the animal is even there. Usually, the animal realizes there is no imminent danger and does accept me as a non-threatening photographer rather than a hunter. Of course, this is much easier where hunting is not allowed, which makes Wildlife Refuges and National Parks prime locations for wildlife photography. I did grow up in the farmlands of Lancaster County and was groomed to be a hunter at the age of twelve. I still hunt white-tailed deer and black bear, but I spend much more time out in the woods with my Nikon camera gear. The skills I learned from hunting are sometimes helpful, such as locating sign of animals and observing their behavior and patterns. With camera in hand, I don’t want my subject to think I am hunting it. I want the animal to realize I won’t hurt it and just want to photograph it. Sometimes talking calmly to an animal can help, too. Another highly successful method I employ is to situate myself in a place to where the animal is headed and will eventually walk through as it meanders on its way. This is exactly the method we used with this Bull you see in these four photographs. I happened to see him not far off the road and I could see he was heading in a specific direction. I reasoned that he was going to eventually come by a specific location, so we moved to that location and waited for him to arrive. This was relatively easy because we could see him in the open some of the time, but this method works well even when you cannot see the subject if you know the well-traveled trails and habits of the animal you are photographing. Still another method I have used this past year is to use a portable blind. My son and I got closer to wild white-tailed deer in Elk County using this method. We both got into the blind well before sunset and just waited. Again, we knew this particular field was often frequented by deer in the evening. We picked our favorite location on this field, set up the blind, and waited. Sure enough, eight deer came out into the field and we had the chance to observe them up close and personal. This is the goal-getting closer to our subjects. It is not always easy but it is well worth the effort! Oh yeah, one more tip on this subject-patience is key. By nature, I am not the most patient person in the world, but I can sit or stand at a spot for a very, very long period of time waiting to capture wildlife photographs. Most people take a few photos and move on. Don’t. Take your time and “work” the subject. Observe and photograph what the animal is doing. Try to capture facial expressions and body movements. Think about what close-up photographs might work with this subject. Focus your attention on separate parts of the animal’s body and create some art. Is there a tail wagging to chase away a flea? Are there long eyelashes on the eye of this animal? What are the position of the legs and feet? Will they be in a more photographic position if you wait for the animal to move five more feet? What about the background; could you wait for the animal to move in front of a better and more attractive background? Wait, watch, observe, and photograph! With these tips you should be able to get closer. Enter today’s tip: use your vehicle as a blind! Sometimes it just makes sense to stay in your vehicle and shoot out your open window. Many animals are accustomed to cars and trucks coming near them, but when someone is walking toward them they flee. It comes down to their basic instinct: fight or flight. By using your vehicle as a blind, you can often get close to your subject without alarming them. They might look up to see what’s going on, but they often retain their previous behavior because they perceive the vehicle as something quite safe and something they are used to seeing around them. In some places, etiquette requires the photographer to stay in the vehicle. One place where I photograph eagles strictly frowns upon anyone leaving their vehicles and risk chasing the eagles away. In this case, the only thing to do is learn how to best shoot from your vehicle and obey the unwritten but oft enforced rule. There are some tips and tools that help when photographing out of the vehicle. Sandbags can help provide a steady perch for your lens. Drape it over the window sill and then place the lens down on it. Another option is to buy a support that attaches to a partly opened window and even has a place to install a ball head. Turning off the engine will also help reduce unwanted and unnecessary vibration. Please use common sense, however, and do not stop in the middle of the road. This is not only dangerous, it is downright rude! Using your vehicle as a blind can help you get closer to your subject. Give it a try the next time you have a chance. Well, as promised I have some photos of my newly constructed blind. Please don’t get overly excited about this because my blind is not really anything to write home about. It will not win any building awards, that’s for sure. 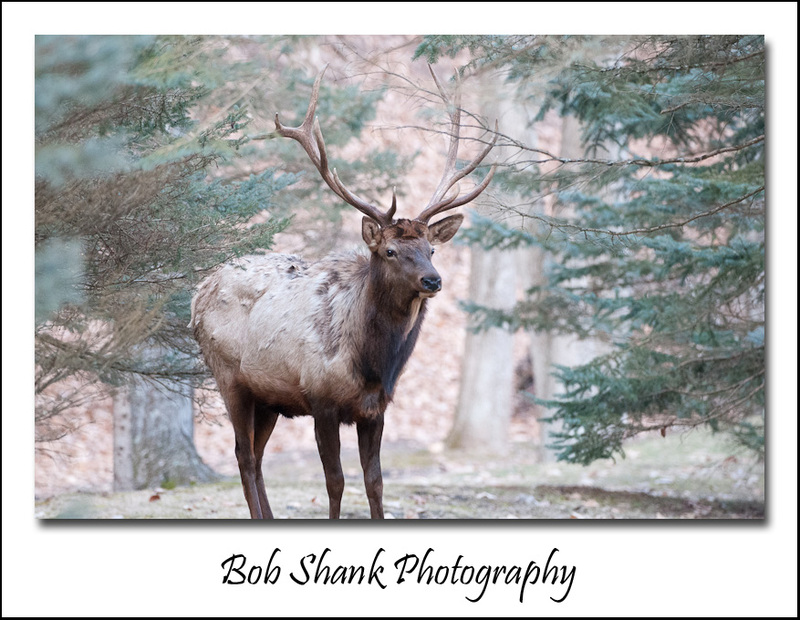 My idea was inspired by Buckwheat, my photography friend who I’ve come to know up on the elk range. Buckwheat takes incredible wildlife photographs. 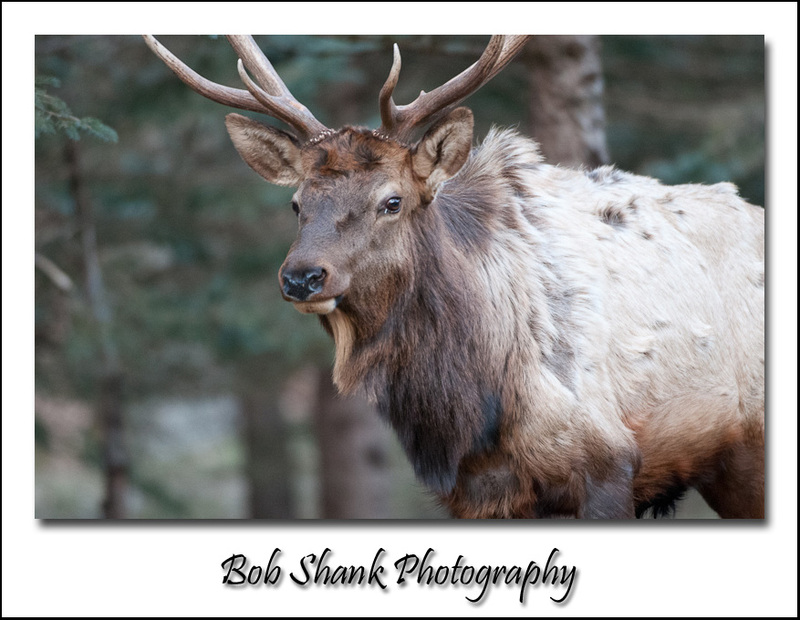 His photos have graced the pages of Bugle Magazine and they have also been on the annual Elk Foundation calendars. Buckwheat knows his subjects and he takes some incredible and even breath-taking photographs. Two weeks ago he was showing us a lot of his backyard bird photos. I asked all kinds of questions on how he did this and the main thing that stuck with me was that he photographed out of blind. I came home and got to work designing and then building a blind of my own. The core construction is made out of 1 1/2 ” PVC pipe. It required four ten-foot lengths of pipe, four T-connectors, and eight elbows. I learned quickly that it is best to lay everything out the way you want it before gluing the connections. I purchased the camouflaged material from Walmart and I believe it was manufactured by Remington. I used rope to secure the material to the frame. The roof is a piece of corrugated roofing, which I purchased at Lowes. I got a 50% discount because the piece was damaged on the edges, but it works for my blind! I secured the roof with u-bolts around the PVC frame. I made sure to glue the pieces in a way which allows me to disassemble the frame so I can store it or move it to another location very easily. 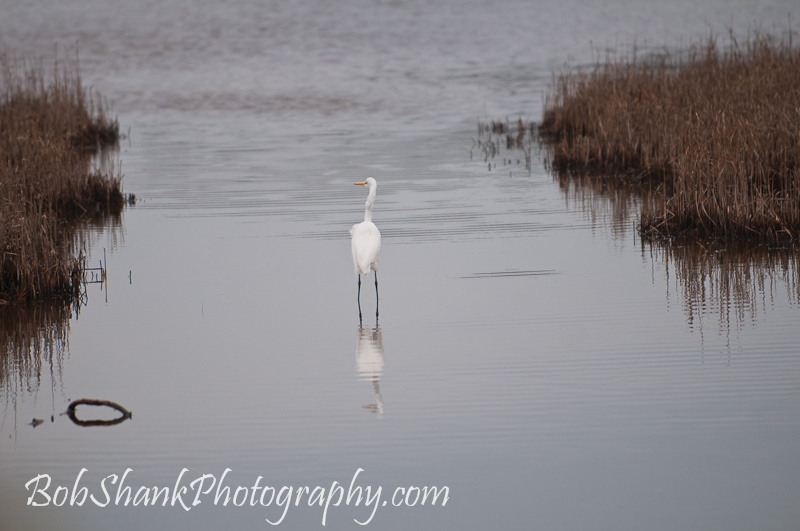 It is nothing fancy, but it allows me to get closer to the wildlife I am photographing. Do You Have an Itch? Life in the blind is starting to be a welcome experience for me. I had read and heard about the use of blinds for wildlife photography, but until I constructed one myself and actually used it I had no idea how helpful a blind could be for me. It is awesome! 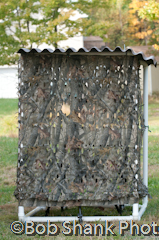 Tomorrow, if the weather cooperates, I am hoping to have a few photos of my newly constructed blind. It was easy and inexpensive to build and the results didn’t turn out half bad. 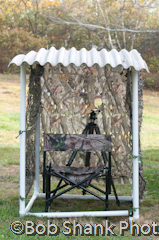 I am excited about the photos I should be able to get while hiding out in this blind! I will even be able to scratch my itch without worrying that I might scare off an animal! I am enjoying the new blind I constructed this week. Today I made some refinements by gluing some additional connections, using rope to hang the camouflage material, and adding a corrugated roof. The blind is really starting to take shape now. The few remaining steps include painting the basic structure and making some perches for the birds to use on their way to and from our bird feeder. 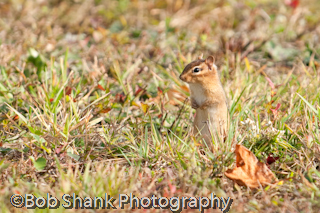 Today’s photograph is of a chipmunk that we’ve been seeing for some time. Since I was in the blind, he never knew I was there when he struck this pose. It’s not a great photo by any means, but it gives me much hope that this blind is going to really enhance my wildlife photography! 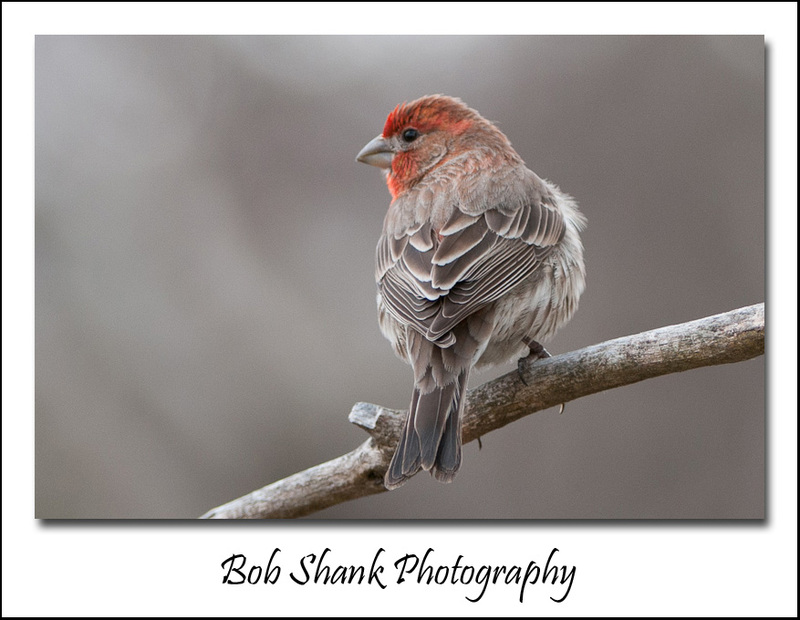 Bob Shank Photography | Powered by Mantra & WordPress.